It is our pleasure to welcome you to our Web Page. We hope we can help you find that Antique piece of Machinery or Real Estate that you are looking for. We specialize in Antiques, Real Estate, Commercial, Industrial, Farm and Machinery, as well as Household and Estate Auctions. We do accept Absentee bids. If you are looking to sell property, a public auction can maximize your sales revenue above any other method of selling. Brian DeBolt Auction Service, Inc. based in Plano, Illinois in conjunction with the Illinois State Auctioneers Association is CERTIFIED and promotes the auction method of marketing and enhances the professionalism of this skilled trade. Furthermore, we are trained to efficiently conduct auctions of a wide variety of commodities from antique, household, business liquidation's, estate, real estate, along with other personal property liquidation's. Planning a fundraising auction or charity auction? 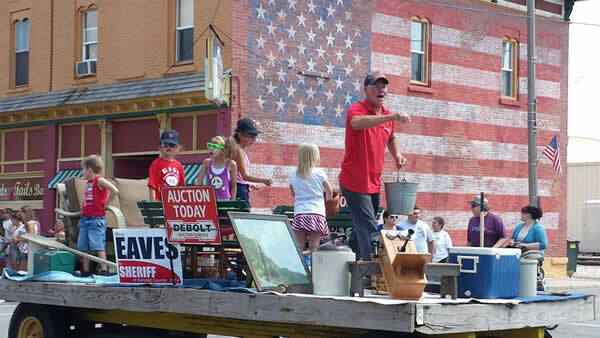 You need more than an auctioneer with a rhythmic auction chant. You need an experienced professional who can maximize the outcome of the most important fundraising event of the year. Brian DeBolt Auction Service is at the top of our field in the auction business. We are professionals well versed in the psychology of selling. Our education, experience and networking capabilities stimulate competition among bidders, to help you get the highest price per sale. We can bring you potential buyers through experience with multi-media advertising.